Dr. Lee will concentrate his work on the economic side of the project, using his expertise to work on sound economic modeling and empirical techniques. Dr. Jamie (Donghoon) Lee holds a B.Sc from the University of Victoria and a Masters degree and Ph.D. in Economics from the University of Guelph. He specializes in environmental economics, econometrics and applied microeconomics. Jamie’s research has addressed topics such the political aspect of the carbon tax and social discount rates used in public projects. His recent work that looks at the political side of implementing carbon taxes will feature in an upcoming issue of the journal, Strategic Behavior and the Environment. Alberta, like Southwestern Ontario, is remaking its rural and economic regional identity through new broadband investment strategies. In the words of Mark Wolfe, “a region is not a region unless it knows it is a region” and from the R2B2 project we can add the following, “a region like SW Ontario knows it is a region when it takes on the challenge of rural broadband!” A case in point: Niagara Region teaming up with the Western Ontario Wardens Caucus on the proposed SWIFT Network (www.swiftnetwork.ca). Mark Wolfe congratulated the Ontario Agricultural College on R2B2project.ca and he argued that we lack the type of communications that helps individuals and organizations across Canada’s various provinces and territories to exchange experiences in rural broadband and its relevance to communities and regional development. He proposed that we consider a Canadian magazine along the lines of Broadband Communities (http://www.bbpmag.com/) in the USA. There is still alot of research to be done, says Mark Wolfe. Efforts, for example, for data stewardship and interactive GIS mapping of connectivity are essential. Solid research supports platforms for multi-stakeholder deliberations and decision-making. Our thanks from the R2B2 team to Dr. Mark Wolfe, and to guests from the general public as well as OMAFRA, MEDEI, Ontario Federation of Agriculture, colleagues from Ryerson University and University of Guelph staff, faculty and students who were able to join us for this seminar! 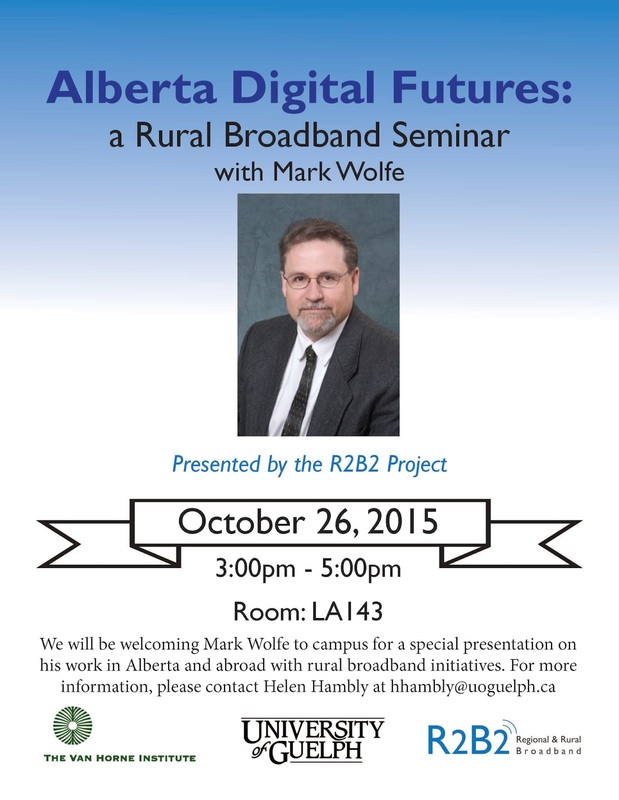 On October 26 we will be welcoming Mark Wolfe to the University of Guelph campus for a special presentation on his work in Alberta with rural broadband initiatives. He will be coming fresh from the Van Horne Institutes’ Digital Futures Symposium on Rural Broadband Enablement in Olds, Alberta. He will provide insights into rural broadband initiatives in Alberta, as well as his application PLANTI and his other work in Germany. In preparation of his visit, we have interviewed him about his current project. It is a mobile application currently called PLANTI that he has been developing. Check out the interview below to find out more about PLANTI! What can you tell us about your latest project titled PLANTI? What led you to embark on this project? Pure serendipity — my Airbnb host in Berlin this past March turned out to be a partner in this start-up venture. When we began comparing notes just conversationally, the overlap between their interests and my background in rural broadband enablement in Alberta and Canada was a bit freaky but also an immediate fit. I was introduced to the partners right away and we agreed to work on a North American angle, starting with SME ag producers in Canada as a test market. What is the premise or framework? The mobile app will use gamification technology to simplify and streamline the supply chain for local small and medium sized producers, distributors and purchasers. Using the smart phone to geo-tag photo records of products and shipment specifics build in record keeping while “putting a face to the food” – thereby encouraging transparency and enduring trust relationships. Financial transactions are also built in, recorded and tracked, thereby streamlining the payment process as well.Intended purpose? The primary purpose of the app is to substantially increase the overall efficiency of the producer-consumer value chain, thereby reducing food wastage and improving the economics for small/medium producers and retail consumers. What’s the eventual format and how will it function? Still in development; hopefully I’ll have more on this by the time I come to Guelph. What challenges do you expect in the uptake process of this app? To whom will this app be most beneficial to? What are those benefits? Smaller producers, especially those moving smaller amounts of produce into the wholesale and direct sale system. Greater and more timely movement of food volumes will cut waste, thereby increasing profits and long-term farmer and supply chain sustainability. In that sense, the app also has potential application in the urban agricultural and community gardening movements. What development processes are you incorporating prior to widespread release? Is this app viable on a global scale or is aimed at certain regions? What impact is PLANTI anticipated to have on supply chains and food systems? The app has direct relevance to those jurisdictions, such as Eastern Europe, where the supply chain is still rooted in a smaller producer ecosystem. In Hungary, for example, more than 500,000 farms are 4 hectares or less in size. That’s a huge market dying for efficiency. But in principle the app is also scalable and could have a role in precision agriculture domains as well where likewise distribution systems could use some fine tuning. How does the importance of rural broadband access relate to PLANTI? 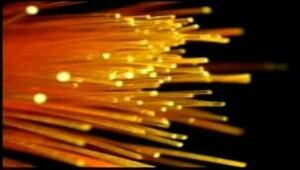 The app depends on robust wireless broadband, which of course is typically under girded by fibre infrastructure. Election campaigns are ramping up across the country and there is a flurry of announcements from the Federal government relating to connecting Canadians. Canada’s 150th celebration is approaching in a few years and in preparation, Canada has launched its’ Digital Canada 150 strategy. First announced back in 2011, this strategy is aimed at preparing Canada for the digital future, making sure Canadians remain competitive in the global market. This announcement included a statement saying 98% of Canadians will be connected with a minimum target speed of 5mbps. Accompanying that is $305M provided to invest in rural high-speed internet services. As part of the current federal election campaigns, PM Harper announced in Lancaster, Ontario that the conservatives would provide an additional $200M mainly for fibre service to further improve rural broadband. As part of the announcement, Harper indicated the Digital Canada 150 internet initiatives are on track and are on budget and are already surpassing the set goals. Following this, Trudeau announced that the Liberal would double infrastructure spending to the tune of $125B over the next 10 years to jump start the economy. Portions of these funds would be allocated for communications infrastructure, bringing better internet service to unserviced and under-served Canadians. Regardless of which party prevails in the October election, Canadians’ rights to having access to high-speed internet service are being addressed. There is an understanding among all parties that ubiquitous high-speed internet access in essential to the growth of the Canadian economy. This is great news for Ontarians should this funding happen. Earlier this year, the Ontario Liberals announced in their Moving Ontario Forward plan that some of the $11.5B allocated for infrastructure will be designated for ultra high-speed broadband (See previous post here). Adding up the potential incoming investments in broadband infrastructure, it’s clear that positive change and meaningful expansions are coming for rural areas with this unprecedented funding. Internet regulated as a Utility? Much debate has arisen over the years about the unfair prices of internet access. The communications oligopoly in Canada is seen by many to be bad for the wallets of Canadian. There is often little choice of what service to use and often are left with a hefty bill. This victimization has led to suggestions that internet service should operate as a utility to enable fair pricing. Internet is quickly becoming the main way Canadians communicate to each other by voice, email, and video. Telephone service is going by the wayside for many as it is seen as an unnecessary expense and a dated technology. Telephone was established as a utility that every Canadian had a right to have access to. With internet now serving the role as a main communication tool, some wish to see increased regulation. In urban areas, internet service is for the most part guaranteed. With Bell and other incumbents, as Bell’s Gigabit Fibe service stands at $150 compared to Old’s gigabit service O-net priced at $120 and Urbanfibre in Vancouver priced even lower at $69. Small ISP’s offer lower rates, but are only available in small areas, Bell will get many customers just because those customers have not other option if they want faster speeds. Adding to arguments that internet should be a regulated service, with the onset of gigabit service, the urban-rural divide is increasing. The new investment and roll-outs of gigabit are only occurring in urban settings such as Toronto, Quebec City. No mention is made of rural areas receiving internet infrastructure investments. Can the internet be treated as a utility? Will that help bring faster service to rural Ontario? With initiatives like SWIFT already making headway in bringing gigabit service to rural Southwestern Ontario. With an aim to bring 1 Gbps service to 3.5 million people for under $100, regulation may not be the best answer. Adding more players to the market can increase competition and lower prices, and help bring high-speed service to under-served areas that deserve parity with their urban counterparts.